©Tom Parr. Many thanks to Kev Parr (www.kevparr.com). 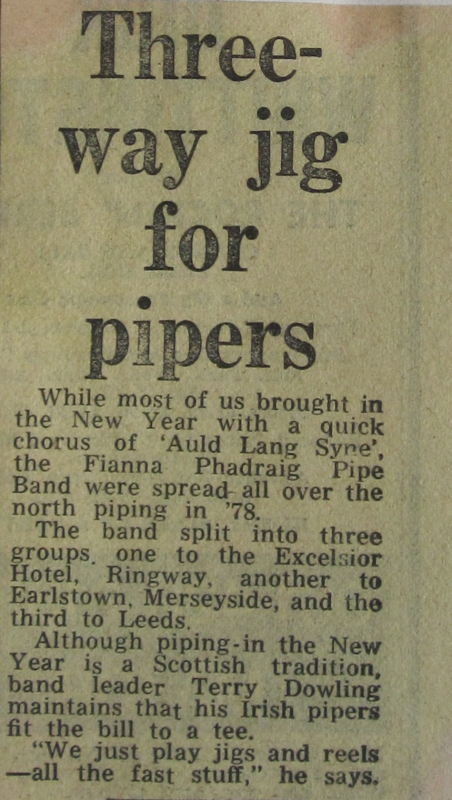 The choice of event for the Band's initial forays outside the Manchester area was perhaps indicative of the ambition which was to characterise the Fianna Phádraig Pipe Band throughout the 70s and 80s under the late Terry Dowling, our iconic Pipe Major from 1956 until his untimely death in 1991, and one which has been rekindled in recent times by our charismatic leader, Bill Lisgo. 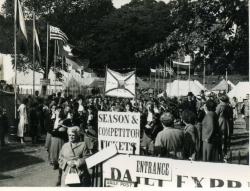 The event in question was no less than the Llangollen International Eisteddfod, at which the Band played in the early fifties. On the grounds that there's nothing like being thrown in at the deep end when you are trying to learn to swim, Fr. 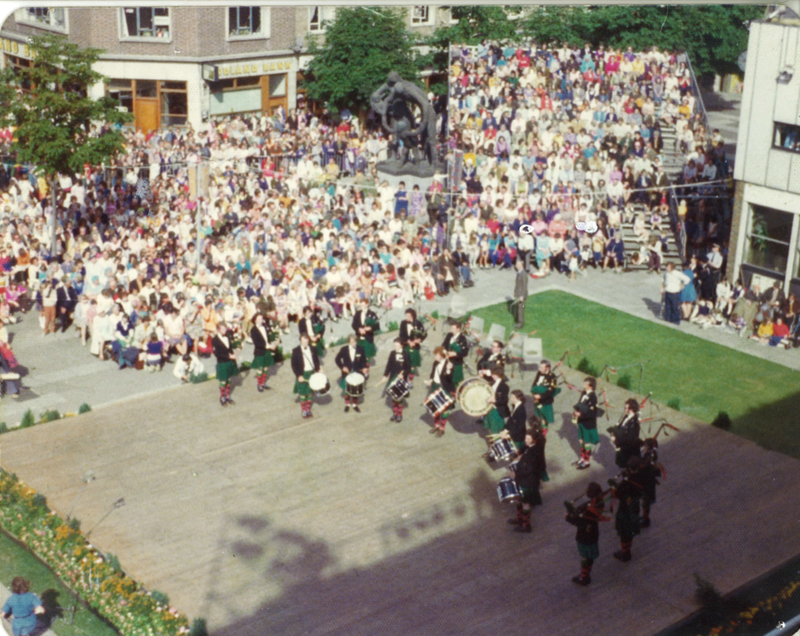 Kehoe took the boys and girls of St. John's Dancers and Pipe Band and the now famous Fianna Pádraig banner down to North Wales to rub shoulders with bands, dancers, artists and performers of renown and gain the experience which was to stand them in such good stead over the subsequent years. The Band won honours at the Eisteddfod, carrying off third place in the traditional music category! annual dinner-dance. 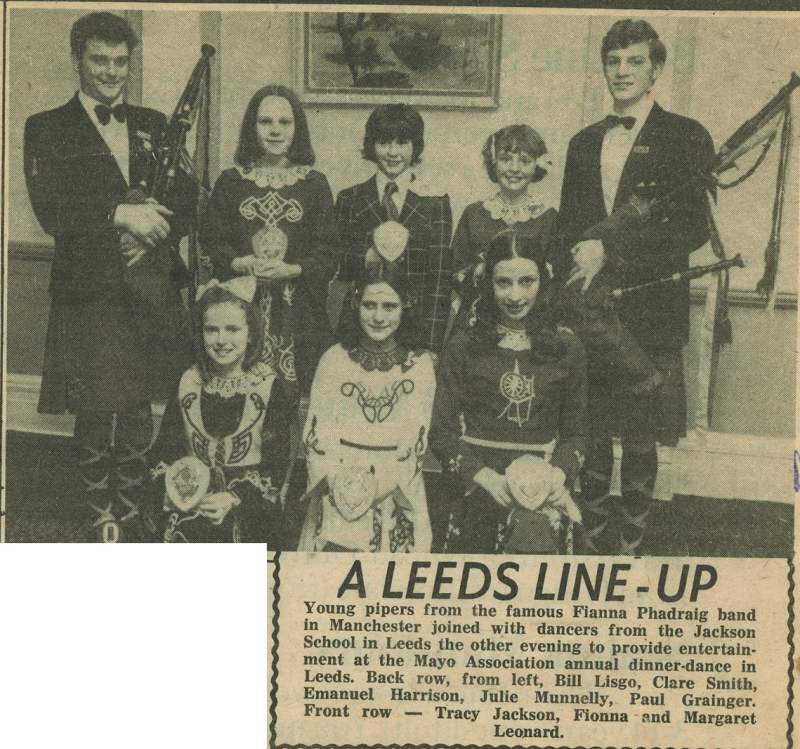 From the Fianna Phádraig collection.Over the decades, the Band has travelled the length and breadth of the country, from Leeds to Liverpool, from Billingham to London. Leeds, for example, has played host to the Band on several occasions. The newspaper clipping opposite dates back to May 1975, when the Band played at the Mayo Association's annual dinner-dance. The two pipers present on the photo are Bill Lisgo, our current Pipe Major, and Paul Grainger, who is a member of the Band today. 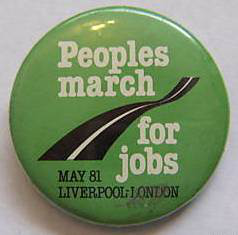 In May 1981, meanwhile, the Band took part in first leg of the People's March for Jobs, playing for the tens of thousands of people lining the roads and marching through the streets of Liverpool, before the participants off on their long walk to London. 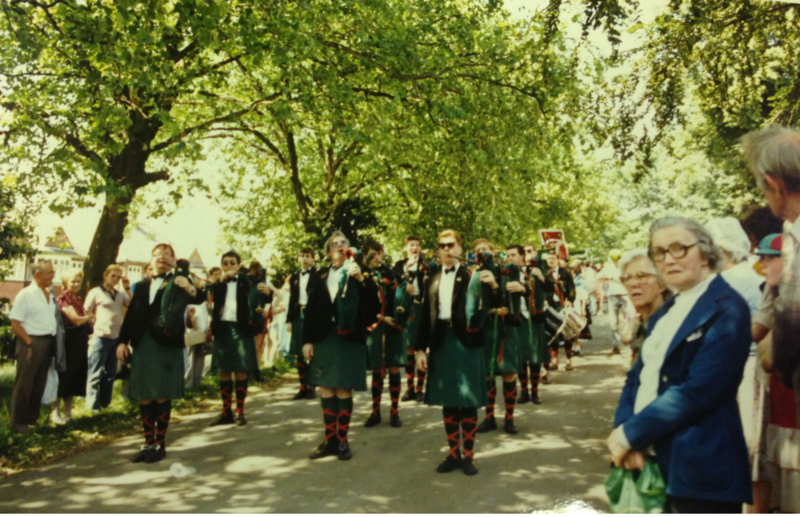 From the Fianna Phádraig collection.In the late 80s, the Band went down South to London, to play at the London Irish Festival in Roundwood Park, Harlesden. The Billingham International Folk Dance and Music Festival. 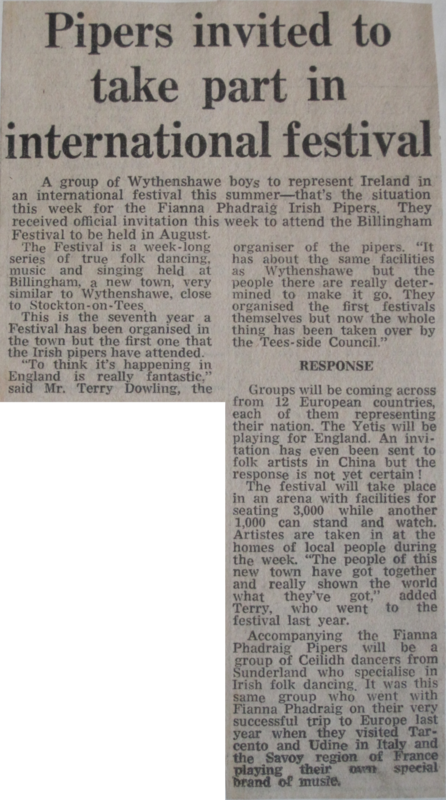 And two decades earlier, in 1971, Terry Dowling had taken the Band to Billingham. 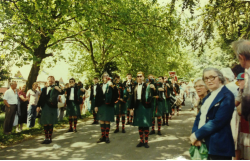 The start of an adventure which saw the beginning of a decade and more of international performances by the Fianna Phádraig Pipe Band. International Folk Dance and Music Festival. From the Fianna Phádraig collection. 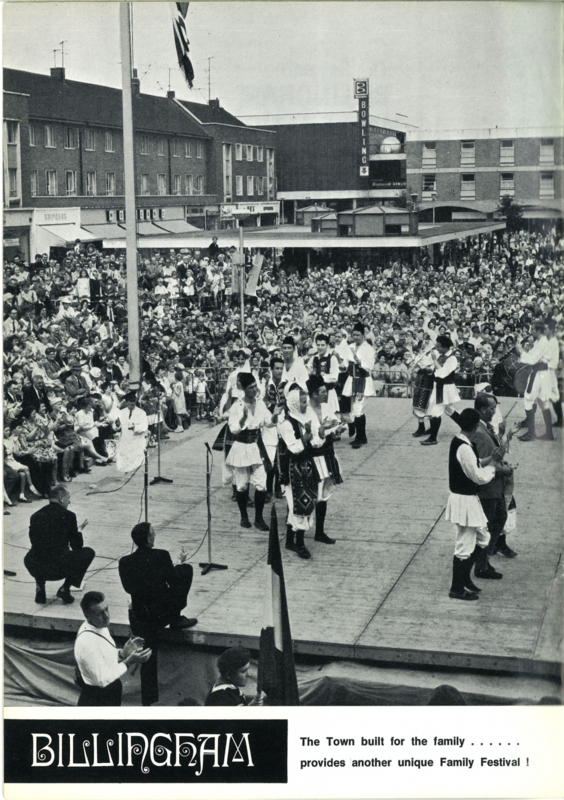 In 1971, after the success of the previous year's introduction into the world of international folk dance and music festivals in Tarcento, Italy and France (see Conquering the Continent), the Band was invited to perform at the Billingham International Folklore Festival, on Teesside. The Billingham Festival grew out of a relatively low-key event intended to entertain Saturday afternoon shoppers into a major date on the international folklore festivals calendar, welcoming traditional musicians and dance troupes from all over the world. In the early 1960s Billingham Council had developed a new traffic free shopping centre. To attract shoppers, the Council organised entertainment in the centre, which, because it was traffic-free, lent itself to such performances. 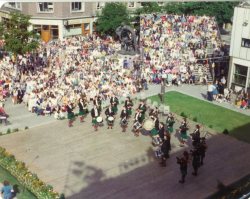 On one such Saturday, an Irish Dance Troupe led by a Sunderland head teacher, Phil Conroy performed on the Town Square and attracted a large and enthusiastic audience. At the end of the show, Mr. Conroy happened to mention that his group had just returned from the continent where they had performed at a week long folklore festival. He also remarked that the town centre would be an idea setting for such a festival. Councillors present liked the idea. 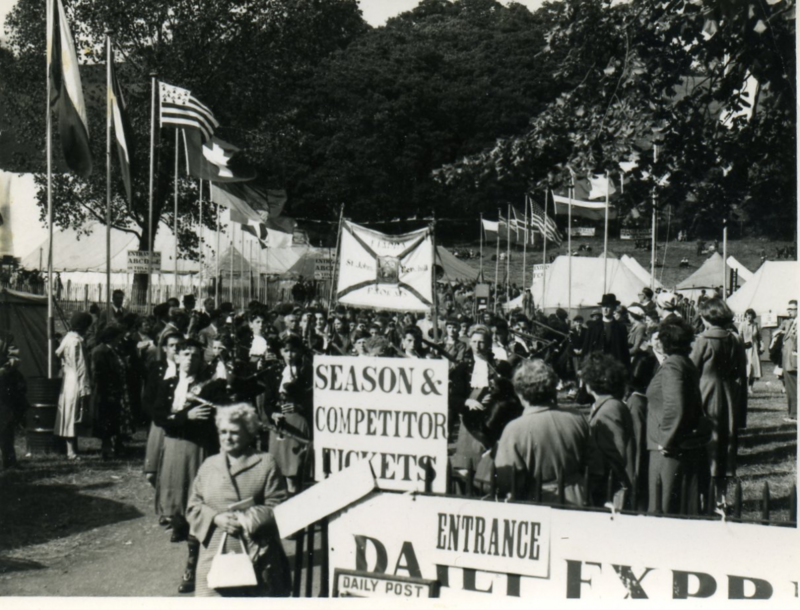 So was the Billingham Festival born in 1965. Billingham then became a founder member of C.I.O.F.F., the international organisation of folklore festivals and Phil Conroy became its General Secretary. a post he held until his death. From small beginnings - only Austria, Estonia and Hungary were represented at the first festival -and now in its 43rd year, over the years the Festival hosted over 15000 performers from more then 90 countries and each year it hosts 8-10 groups with over 400 artists from abroad and presents the best the world of folklore dance and song has to offer at two venues - The Forum Theatre, the Festival Outdoor Arena in Billingham Town Centre. In 1999 the festival became an independent limited company and registered charity. It has also concluded a partnership agreement with Stockton Borough Council which guarantees its future. 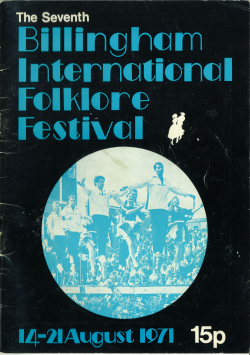 For many of us - some as young adults, others as teenagers and others still barely into double-figures - the Annual Billingham International Folklore Festival, at which we performed in 1971 and again in 1974, was a landmark event. It provided an opportunity - rare at the time - for young adults and teenagers from Wythenshawe to meet and exchange with their peers from places as far afield as Bulgaria, Germany, Hungary, Israel, Italy, Poland, Spain, Tunisia and Turkey, as well as England, Ireland and the British Isles, alongside artistes from the Congo and Puerto Rico (not mentioned in the programme). It helped turn into reality Terry Dowling's dream of introducing the youth of Wythenshawe to cultures from all over the world in a spirit of open-mindedness, discovery and exchange. A dream which led to life-changing experiences for many of us who, wherever destiny has taken us, from the United States to Ireland, from Scotland to Cornwall, from France to the Middle East, from India to Australia, from Woodhouse Park to Holmes Chapel and from Newall Green to Derbyshire, remain proud of our Wythenshawe roots and are grateful to this day to Terry Dowling and the Fianna Phádraig Pipe Band for the opportunities we were given. Check out the programme of the 7th Annual Billingham International Folklore Festival here. The Band is featured on page 40, but we encourage you to take a closer look at the full line-up and the events organised around the festival. The programme opens in a pop-up window. To view it correctly, pop-ups must be authorised in your browser settings. You can change pages via the arrows displayed on the screen or using the arrow keys on your keyboard or by simply clicking and dragging the corner of each page. You can zoom the page by simply clicking on it. Move your mouse up and down to scroll the page. A second click on the page takes you back to normal view. 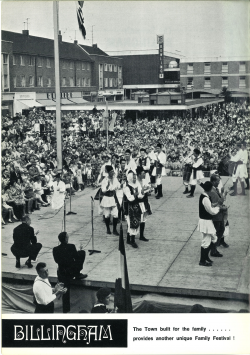 A short history of the Billingham International Folklore Festival compiled by Eamonn O'Neal. Many thanks to Eamonn for his contribution.